With the improving weather we have seen the number of students who ride bikes to school start to rise in recent weeks. I thought I would take this opportunity to remind students and parents of our rules surrounding bikes at Chauncy. We encourage cycling and other forms of sustainable transport to and from school but we are concerned about the safety of our children on their journeys to school. In 2015 alone 3,337 cyclists were killed or seriously injured on UK roads. We have worked closely with Hertfordshire Police and the East Herts Community Safety Partnership over the last two years to agree the following measures which will go some way to keeping our children safe on the roads in Ware. An appropriate HELMET which must be worn whilst riding the bike. Front and rear working LIGHTS. 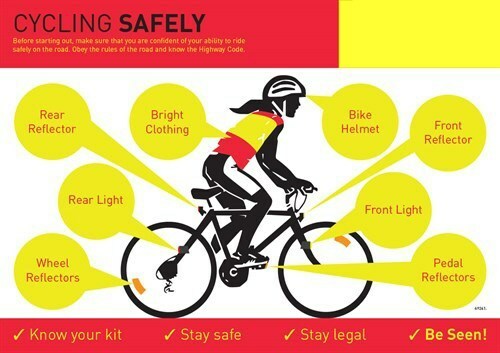 We will be checking that all students and staff follow these simple rules and we will confiscate bikes if riders do not have helmets, lights and brakes. Hertfordshire Police will also carry out spot checks on access roads to the school. In addition, bikes and scooters are banned from inside ASDA and their carparks.